PanaHome MKH Malaysia Sdn Bhd (PanaHome MKH Malaysia), a consolidated subsidiary of PanaHome Corporation (PanaHome), will provide both construction (building framework) and Living Design Package (built-in interior furnishing and layout planning) for the Maple @ Hillpark Shah Alam North, a housing complex consisting of 490 units of two-storey terrace houses spanning a total area of 161,510m2. 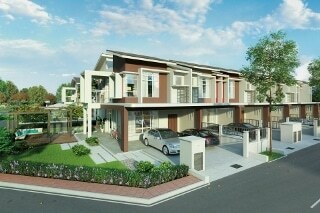 This marks the company’s foray into the housing business in Malaysia. Construction of Maple @ Hillpark Shah Alam North began early this month and is scheduled for completion by May 2018. Other projects in the pipeline include two upcoming high rise housing projects – SAVILLE @ D’LAKE PUCHONG and TEMARA KL. In Malaysia, property purchase decisions typically involve two steps – a buyer first purchases the house from the developer with minimal interior finishing, and then separately engages an interior designer to customise the lighting as well as built-in furniture for areas such as the kitchen, and walk-in closet in the bedroom, according to their preference and budget. The provision of PanaHome MKH Malaysia’s construction and Living Design Package serves as a one-stop solution for potential buyers, offering a building framework with compatible interior furnishing. Wall Pre-cast Concrete (W-PC) construction method utilising pre-fabricated materials and structure. W-PC is tailored for the Asian market aimed at keeping cost competitive. PanaHome has developed W-PC by leveraging on its construction expertise and know-how in Japan. Compared with houses built using traditional methods, pre-fabricated houses1 that are constructed under the W-PC method involve less complex work, ensuring high quality houses and, cutting construction time by building a temporary factory at the development site. At the temporary factory, the building’s exterior components such as flooring slabs, walls and roof are fabricated by pouring concrete into steel moulds, then assembled via a crane. PURETECH ventilation system filters out dust and air pollutants, thus keeping indoor air fresh for home owners. The special Air-Tech filter can remove up to more than 95% of harmful air particles. On top of PURETECH ventilation system, the Living Design Package also consists of a Panasonic energy efficient air conditioner, home security system and space-saving kitchen storage system will be available to the terrace houses at Maple @ Hillpark Shah Alam North. “Kajiraku2” a Japanese concept describing efficient flow within houses will be introduced. “Kajiraku” focuses on providing solutions through intelligently-designed house layout and efficient space utilisation that makes housework easier, whilst at the same time enhances security, safety and communication among family members. The joint venture company will provide the Living Design Package to two upcoming high rise housing projects – SAVILLE @ D’LAKE PUCHONG and TEMARA KL. 1 Pre-fabricated house: a type of house which is partially or fully manufactured in advance at the factory, and then, assembled at the development site where the house is to be built. 2 “Kajiraku” is a trademark of PanaHome. The company will enhance the value of living spaces by combining the three important elements of a house – building construction, interior furnishing and layout planning, as well as suite of home appliances. Interested parties can view these technologies and solutions in the showroom located at Kuala Lumpur from 31 March onwards. PanaHome MKH Malaysia is ready to roll out solutions to housing-related challenges faced by people in the country and differentiates itself from local contractors by taking advantage of the Panasonic Group’s comprehensive business strengths and engineering expertise. The development project, undertaken by MKH in the Shah Alam district of Selangor State, began construction in 2014. A total of 2,000 housing units are scheduled to be built. PanaHome MKH Malaysia will construct approximately 490 terrace houses in the Maple precinct under this project using W-PC method designed for the Asian market. The construction for Maple @ Hillpark Shah Alam North began early this month and is slated to be completed by May 2018. Building construction and interior furnishing (utilising Living Design Package) : PanaHome MKH Malaysia Sdn. Bhd. PanaHome MKH Malaysia's Living Design Package has been already adopted for a large-scale condominium project in Puchong. Condominium units under this project will start its sales on mid April 2016. The Living Design Package can be viewed at the showroom in Kuala Lumpur that is set to open on 31 March. Developer : Achieve Acres Sdn. Bhd. Interior furnishing (through Living Design Package) : PanaHome MKH Malaysia Sdn. Bhd.